The Holy Trinity Column, a masterpiece of the Moravian Baroque style, is a UNESCO site in Olomouc, a small town in the eastern end of the Czech Republic. Standing alone at one end of Olomouc’s Upper Square, this memorial column stands 32 meters tall. Covered in impressive artwork, it dates to the 18th century. You can see similar memorial columns in many town squares across the region, often plague columns, memorializing the victims of plague epidemics. This one is a statement both of faith and of gratitude for ending an earlier plague. Besides the artwork adorning it, its size allows a small chapel inside its 17-meter-in-diameter base. Looking up at Holy Trinity Column, you can see some of the statues more clearly. While the column was designed by Václav Render, most of the statuary was created by a Moravian: Ondrej Zahner. The topmost statues represent the Holy Trinity and the Assumption while most of the rest are saints: Biblical saints above and Moravian saints lower down. As UNESCO sites go, this one in Olomouc is small: it’s just the column, which won’t take more than a half-hour to study in detail. 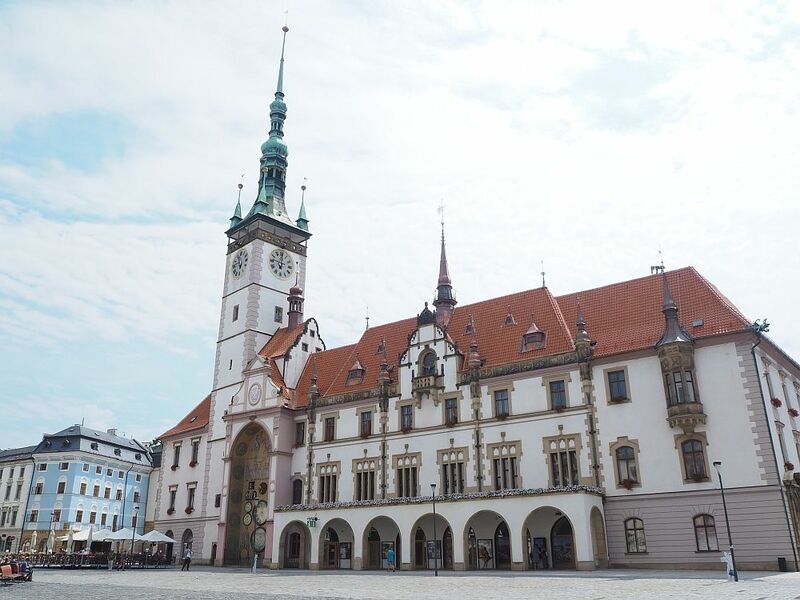 Don’t worry, though; there’s plenty more to see besides this UNESCO site in Olomouc. Upper Square, where the Holy Trinity Column stands, has some pretty buildings around its edges. However, it’s the town hall that drew my attention. Parts of it are 600 years old, and this attractive building dominates the square. On the north side of the town hall is a large astronomical clock, visible in the photo above. 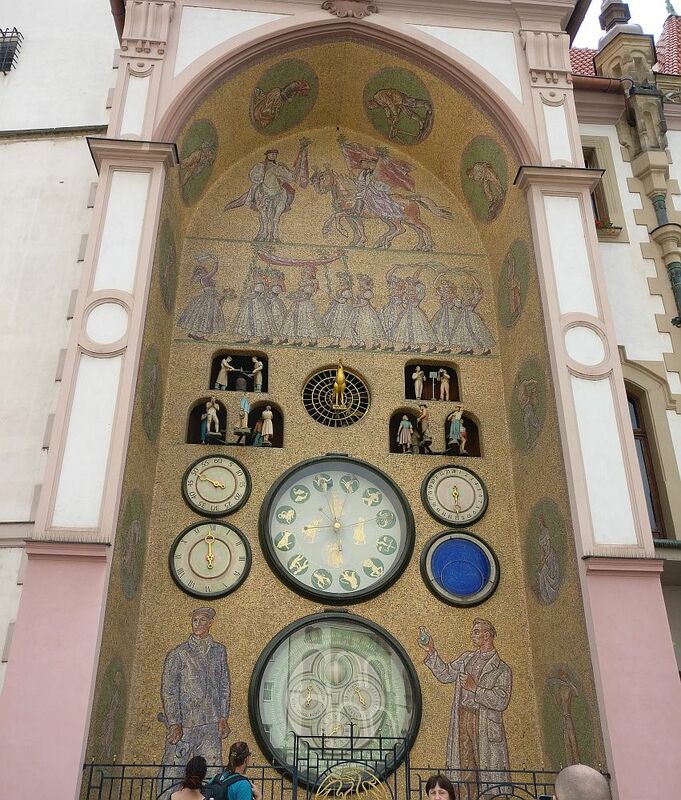 This clock, unlike the famous one in Prague, has a relatively recent appearance. What I mean by that is that though the clock was first added in the 15th century, it was renovated a number of time: in Gothic style, then Renaissance and Baroque. Now, though, its appearance dates from the Communist period in the 1950s. In other words, it’s a remarkable example of socialist realism. 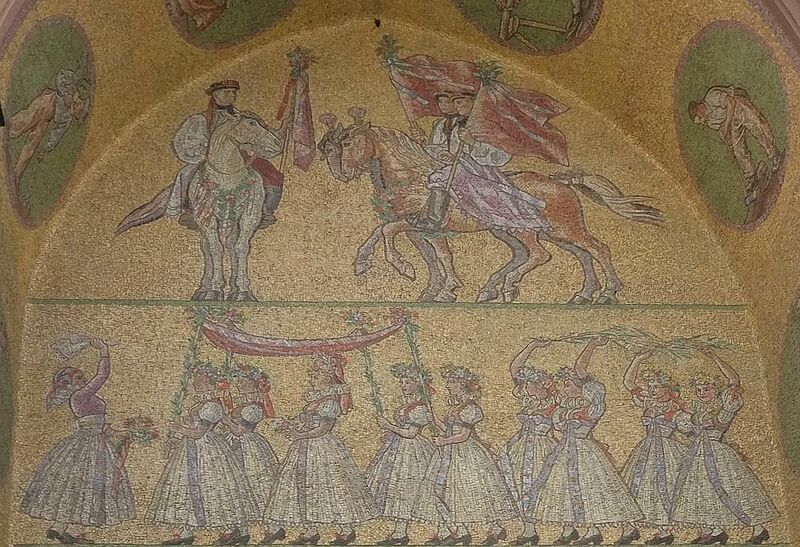 The sides of the niche show peasants working in the fields, while the two men on either side represent the working class, contributing to a socialist future. 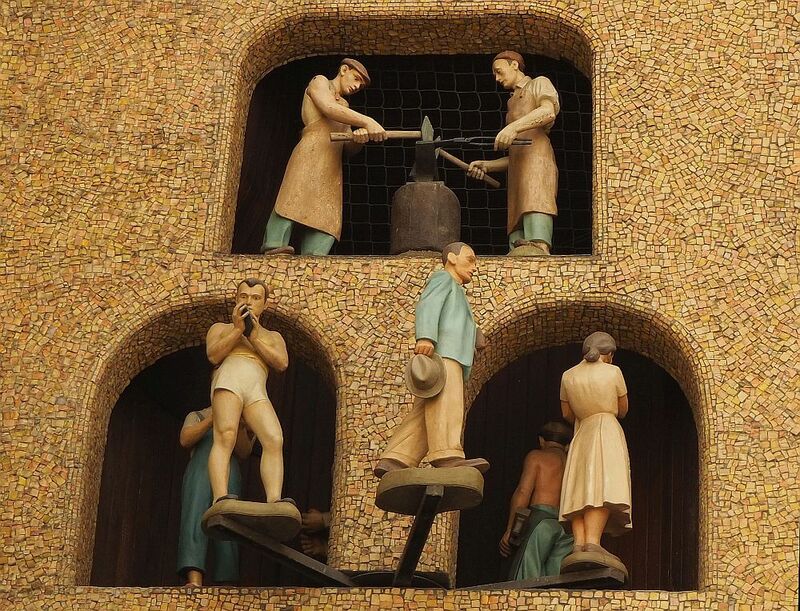 These large figures on the clock in Olomouc represent ideal socialist workers. 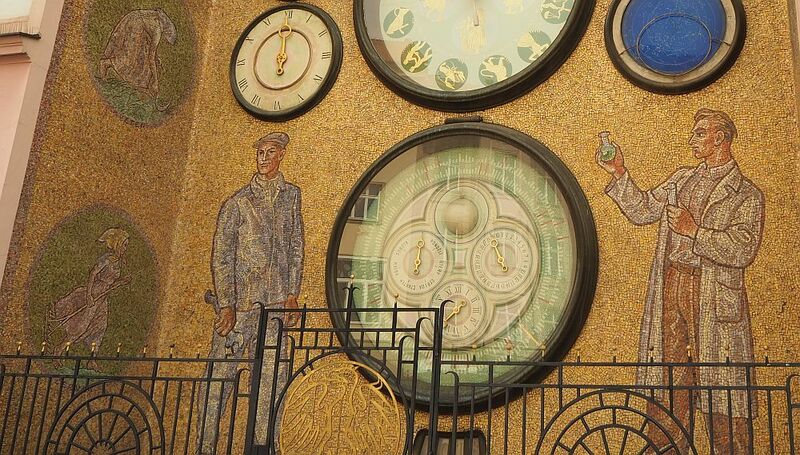 The small figures above them turn slowly every day at noon, while a song plays. They seem to represent various socialist ideals: athletes, schoolchildren, laborers, etc. These figures move slowly around as the music plays. 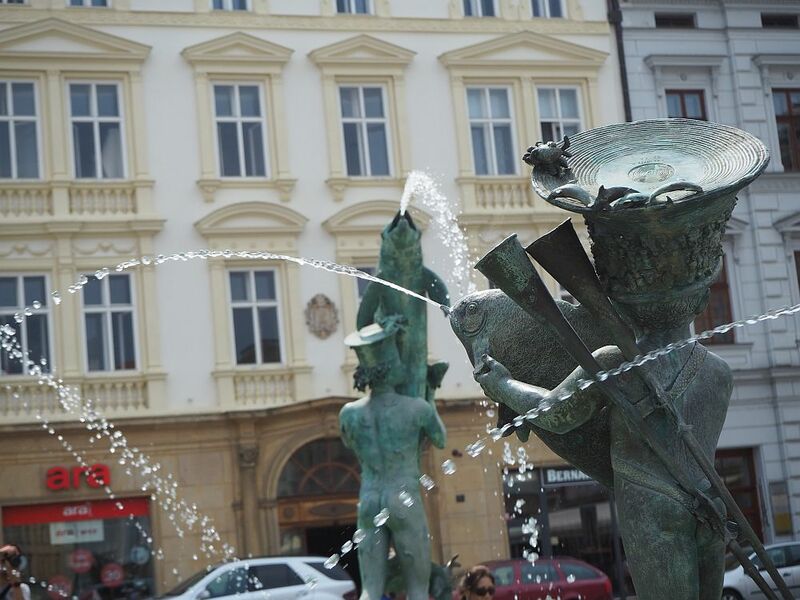 Besides the UNESCO site in Olomouc, the old city center of Olomouc holds not one, but six monumental fountains. All are based on ancient and mostly mythological subjects – Hercules, Mercury, Caesar, Neptune and Jupiter – and most were built in the 17th and 18th centuries. I won’t go into all of them here, but my favorite, surprisingly, was the newest. Called Arion’s Fountain, it was built in 2002 and depicts the ancient myth of Arion. The pool of the fountain holds three groups of sculptures: an obelisk on top of a turtle, two children, and Arion with the dolphin that, according to the myth, rescued him in response to his beautiful singing. Arion’s fountain. In this photo, you can see one of the children and, in the background, Arion with the dolphin. Here’s another photo; I really liked this fountain! 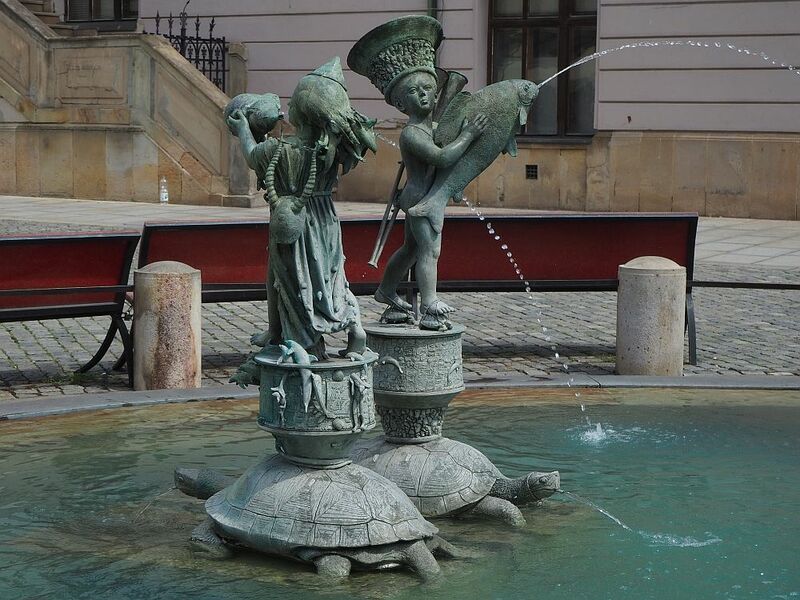 Arion’s fountain is on Upper Square in Olomouc, very near the UNESCO site Holy Trinity Column. Notice the details on these two figures! If you walk just a matter of a block or two from Upper Square to the church of St. Maurice, you can explore a late Gothic church as well as climb the tower to admire the view. The furnishings inside the church are a mixture of late Gothic and Baroque pieces: definitely worth a look before or after you climb. At the top, Upper Square is visible, as well as wide views in all directions. 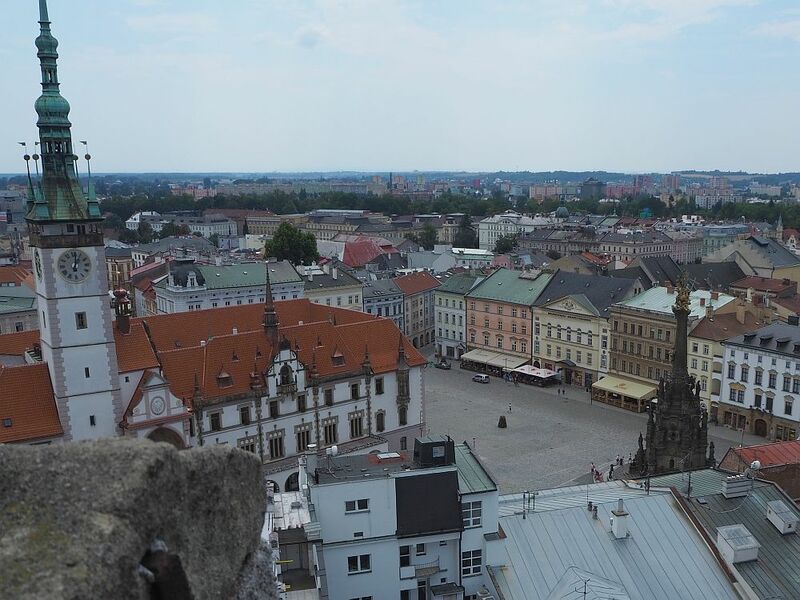 A view of Upper Square in Olomouc as seen from St. Maurice church tower. You can see the UNESCO site Holy Trinity Column on the right and the town hall spire on the left. 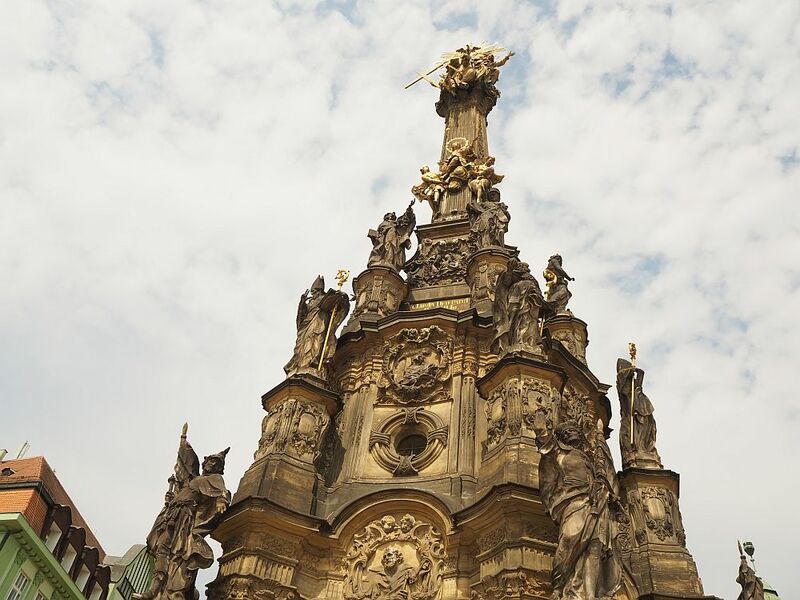 I didn’t manage to get there in the limited time I had, but you should also check out the Cathedral of St. Wenceslas at the other end of Olomouc’s old center if you like historical architecture. Dating from the 12th century, it was originally in Romanesque style, but later altered to Gothic. If you’re not driving, it’s easy to get to Olomouc by train or by bus from Prague or Brno. 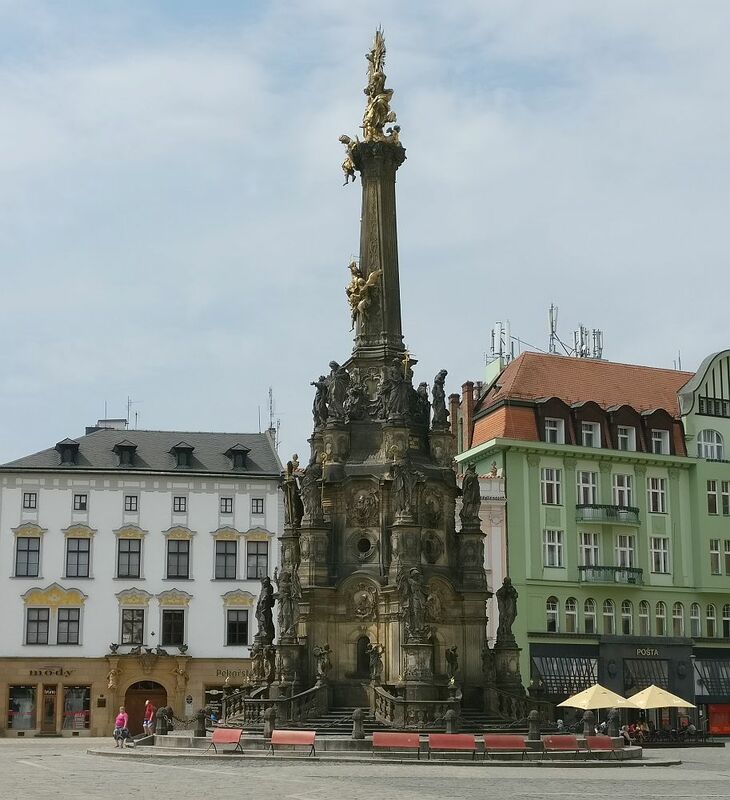 The column is on Olomouc Upper Square, about a half-hour walk from the train station, with plenty to see in the old city as you walk. The tower of St. Maurice has no fixed opening hours and no set price. Drop a donation in the box at the entrance to the tower. For a place to stay, I often use booking.com: here’s a link to listings in Olomouc. Please share this post! The images below are formatted for Pinterest.